Fast population growth in the city of Vienna is largely related to international migration. Long-standing migrant communities represent half of Vienna’s population. In 2016, 50% of the inhabitants had migrant backgrounds, and since 2015, the number of refugees and asylum seekers in the city has increased. Since 1971, the city has developed dedicated administrative structures and local policies for migrants. A dedicated municipal unit (MA17) oversees how departments achieve migration-sensitive standards in their respective policy fields and produces the yearly Vienna Integration and Diversity monitoring report. A good practice is “Start Wien”, a comprehensive coaching and information programme addressing newcomers (including asylum seekers) for the first two years after arrival. After that, foreign residents benefit from non-targeted measures, for instance from a programme fighting labour market exclusion of low-skilled groups. Vienna has avoided high segregation due to its large and well spread social housing. However migrants can only access it after five years of residency in the city, before which they rely on private rental market. 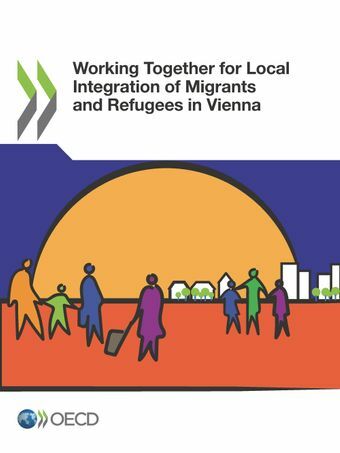 Vienna establishes close contacts with migrant associations and NGOs at the district level and engages public consultations when formulating integration concepts. This report sheds light on how the municipality and non-state partners work together with the other levels of government for sustainable migrant and refugee integration. Working Together for Local Integration of Migrants and Refugees was launched at OECD Headquarters on April 18th, 2018. This Case Study of Vienna highlights the need for more reliable sources of financing and dialogue among levels of government.